I talked a few years ago about a very goofy story in Lois Lane #36, where everybody at the Daily Planet pretended that they never heard of Lois Lane, with the apparent result that she committed suicide by hurling herself off a cliff. 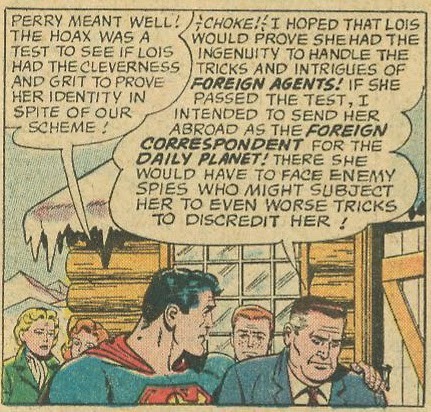 It turned out (of course) that she didn't really off herself, and that it was all just a test to see if she could handle the wily tricks she'd have to face as a foreign correspondent for the Daily Planet. It took a couple issues, but eventually we got the follow-up. Jimmy insists on checking the back issues of the Planet, as does Lois, but there is no record of their award-winning scoops. They both head back to their apartments, but are startled to find other tenants in occupancy (in Lois' case it's especially cruel as her sister declines to recognize her). They realize that they're being tricked for different reasons. Jimmy had called for the "Chief" when Lois didn't recognize him and as he's the only one who calls Perry by that nickname, he realizes that since Perry emerged from his office he knew Jimmy despite his denials. Lois goes to see Lex Luthor in prison, but since Lex is in solitary she figures out that the warden would never let her see him. But the king overhears the clicking and only Clark's swift grabbing of the camera saves Jimmy from the firing squad, although Clark himself is imprisoned. From there the story develops rather predictably; Jimmy has a secret key that can open the prison door, so he tries to get himself arrested, but every time he ends up actually helping out King Otto. 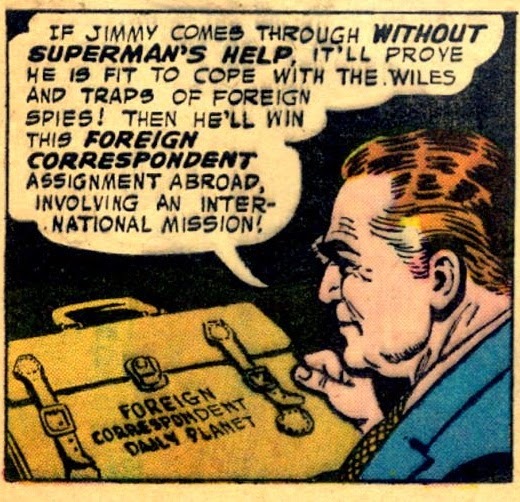 Eventually he succeeds, but the key subplot apparently gets forgotten and Jimmy and Clark are facing the firing squad. But Clark blows the bullets away, and then takes care of things as Superman. 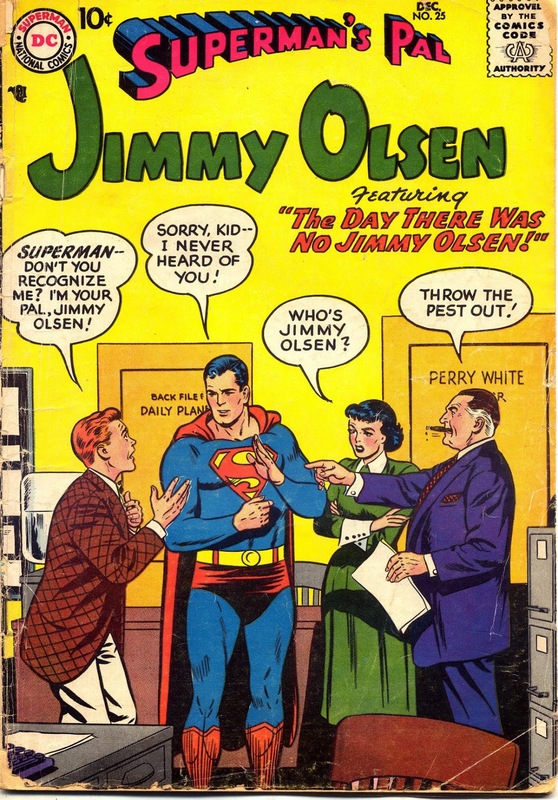 This swipe is a little quicker than some of the other ones Weisinger did--Lois Lane #36 was published in October 1962, a little less than five years after Jimmy Olsen #25 (December 1957). But it is certainly noteworthy because of the lead-in nature of both stories to later tales.